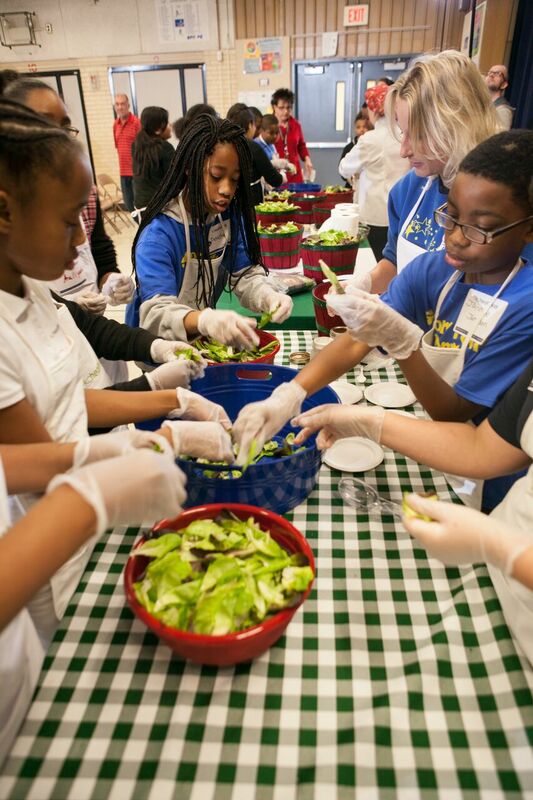 KC Healthy Kids to expand efforts to connect children to local food, school Gardens and food and agriculture education. "Aligning with state, regional and national initiatives on policy and programming is a great way to reach more kids and their families. It also makes it easier to get more local food into the lunchroom," says Rachael McGinnis Millsap. KC Healthy Kids has been named as the 2017-2019 National Farm to School Network Kansas Core Partner, providing opportunities to expand efforts to connect children to local food, school gardens and food and agriculture education in Kansas. As the Kansas Core Partner, KC Healthy Kids will build capacity and support for the expansion of farm to school and farm to early care and education efforts in Kansas. It also will serve as a liaison for information, resources, needs and opportunities with the National Farm to School Network. KC Healthy Kids will collaborate on these initiatives with Kansas State Department of Education and Kansas Appleseed, which serves as a National Farm to School Network Kansas Supporting Partner. “Partnering with the National Farm to School Network and supporting agencies will strengthen our programming and elevate farm to school and early care and education in the state,” says Rachael McGinnis Millsap, director, Farm to School Academy, KC Healthy Kids. “Aligning with state, regional and national initiatives on policy and programming is a great way to reach more kids and their families. It also makes it easier to get more local food into the lunchroom," added Millsap. KC Healthy Kids’ Farm to School Academy offers innovative solutions for increasing kids’ consumption of fresh, local food. The academy engages school staff and faculty, district stakeholders, parents and students in activities that increase awareness of our local food system and generate excitement about the possibilities of bringing fresher, local food to schools. The academy engages students, teachers, food services staff and administrators through a variety of ways. At Tasting Local Events, students sample fresh, local foods prepared in exciting new ways. At Ultimate Eat Local Recipe Challenge, kids get creative and learn to make healthy lunch per nutritional guidelines. The Grow a Garden Classroom Curriculum is a toolkit that teaches everything one needs to know about creating a school garden. Through the Leadership Academy, school food and nutrition services staff gain a better understanding of food systems and culinary techniques, all to help build a more sustainable farm to school program. The Garden to Cafeteria Safe Sourcing Protocol helps food services staff to work with farmers to make sure produce is handled and processed in a way that it can be safely and easily used by cooks in the cafeteria. Under the Food Service Coalition, district administrators and food service directors, suppliers and community partners are invited to quarterly meetings to learn how to get most out of their participation in the Farm to School Academy. 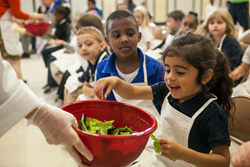 The National Farm to School Network has selected Core Partner and Supporting Partner organizations in all 50 states, Washington, D.C. and U.S. Territories to collaborate on efforts to strengthen the farm to school and early care education movement nationwide, and ensure its benefits are available to all children and communities. To view a complete list of National Farm to School Network Core Partner and Supporting Partner organizations, visit farmtoschool.org/ournetwork. "As our name implies, the National Farm to School Network is a network of partners who are essential to the success of our work, and have been since the organization’s inception a decade ago,” said Anupama Joshi, executive director and co-founder of the National Farm to School Network. "In 2017, we are thrilled to expand our reach to include Core and Supporting Partners in every state and Washington D.C. and for the first time, include the five U.S. Territories, for a total of more than 200 organizational partners nationwide representing non-profits, state agencies, schools, farms and universities." KC Healthy Kids rallies the people in our communities to improve access to affordable fresh food and safe places to walk and play. When our neighborhoods support healthy habits, we are less likely to suffer from obesity, which is linked to Type 2 diabetes, heart disease, and poor mental health. To make a lasting impact, we shape policies that improve our food system and physical surroundings and ultimately, the places where we live, work, learn and play.